Toward the end of “The Most Dangerous Man in America: Daniel Ellsberg and the Pentagon Papers,’’ you begin to realize just how much four decades of history owe to one man. If Ellsberg, a Defense Department-contracted policy analyst, hadn’t leaked 47 volumes of top secret CIA documents to the press and Congress in early 1971, the Vietnam War might have continued indefinitely. Broad public sentiment wouldn’t have finally turned against the conflict, and the Nixon administration wouldn’t have adopted a paranoid bunker mentality. The president wouldn’t have formed his dirty-tricks squad of White House “plumbers’’ to stop the leaks, wouldn’t have sent them out to dig up dirt on Ellsberg by burglarizing his psychiatrist’s office. The Watergate break-in wouldn’t have happened. Nixon wouldn’t have resigned. And so on, and so on – no historic 1971 Supreme Court First Amendment case, no politicizing of the nation’s press for better and worse – and all because one stiff-backed ex-Marine refused to ignore his conscience. “The Most Dangerous Man in America’’ – the epithet comes from Henry Kissinger – is hardly evenhanded: It views Ellsberg as a hero and a genuine patriot and allows him, at a grey and dignified 78, to narrate his own story. But evenhanded is one thing and fair is another, and directors Judith Ehrlich and Rick Goldsmith make their case that if you or I had known what Ellsberg did – the secret story of US involvement in Southeast Asia and the cynical misleading of the American public by five presidential administrations – we would have, or should have, done the same. 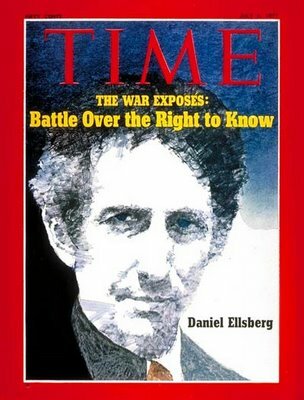 Daniel Ellsberg is definitely a name out of our national past. Baby Boomers immediately conjure up images of the Vietnam War and the Pentagon Papers. 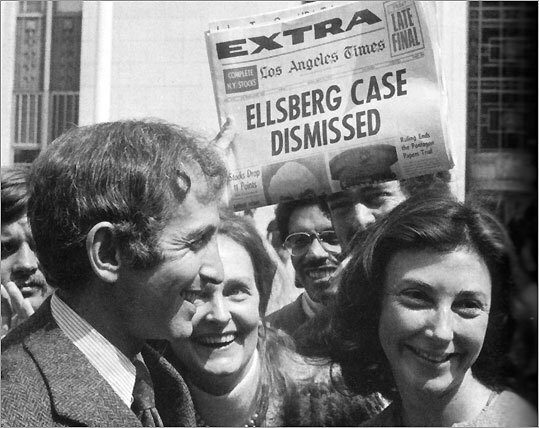 For the younger set, or those whose recollections have faded, there’s a brand new documentary about Ellsberg and his historic actions. The Most Dangerous Man in America opened in theaters across the country this past weekend and is guaranteed to bring you up to speed. In it, whistleblower and activist Ellsberg is both star and narrator. Welcome to OpEdNews, Dan. If you don’t mind, we’ll come back to the documentary later. I’d like to hear your take on current events. We are now officially one year into this new administration. Are we on the way to achieving the change that the voters were so eager for? On Afghanistan, there is change: for the worse, much worse. Not just a tripling of the American troop presence, though that’s bad enough. I believe that’s just the start of an open-ended, indefinitely prolonged fighting occupation. Some of my friends and a large part of the public, perhaps most, believe that he’s committed himself to put a ceiling on the American troop presence of about 100,000. They realize that his officials quickly backed away from his talk in December of beginning to withdraw then, but they think he won’t go above the level reached by this “one-time” deployment (which will be closer to 40,000 than his announced 30,000). I believe that’s mistaken. I expect that no later than his 18-24-month “deadline” and probably much earlier than that, General McChrystal will be asking for a lot more troops. And I now expect Obama to give them to him (if and when troops become available from Iraq, and perhaps elsewhere as necessary). A president who didn’t say “No” to this recent request–the best chance he’ll ever have to do so, when he could still blame a hopeless situation on the last eight years under his predecessor and “reluctantly” name a date for total withdrawal–will find it even harder to do after wasting more lives in coming months. The odds are very high, I believe, that Obama’s War will last as long as he’s in the White House–whether four or eight years–and beyond.